Earth Day is coming this Saturday, and many people start to think about how they can "save the planet", lower their carbon print and do good for this beautiful earth we live on. Recycling is a part of everyday life for many people - in America it might be cans, newspapers and even composting. In developing countries, recycling can be a livelihood. There are trash dumpsites around the world where people live, eat and can even find employment in these poorest of the poor areas. Artisans in some countries like Kenya, can employ these people by buying the "trash" pieces found in dumps, restoring it and reinventing it into beautiful jewelry. (see photo). what ethnic group they were from within the Mayan culture. Some can take 6 mos to a year to make! The women weave the wipils and the men do the sewing of the recycled wipils. 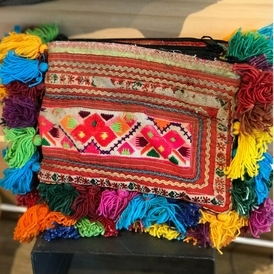 In Thailand, handbags, backpacks, and fashion accessories are made from recycled hill tribe clothing. There are 7 major hill tribes - the Akha, Lahu, Karen, Hmong/Miao, Mien/Yao, Lisu, Palaung each with a distinct language and culture. 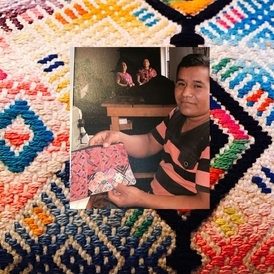 Just like the people in Guatemala, when the tribal people need an income, they can sell their old clothing to designers and artisans who can recycle them into beautiful new fashion accessories! Through our ministry to these amazing artisans, we have seen lives completely transformed - from the oppressed, to the disenfranchised, to prostitutes and criminals being rehabilitated, restored and reinventing themselves into amazingly talented artisans who impact their entire community, God has been able to do immeasurably MORE than we could ever ask for and imagine in their lives. But there are still MORE people that need help! It's kingdom building! Would you continue to partner with us? 1. People to come shop in the store, so our artisans can continue to have employment! Bring your friends. 4. Churches and groups to partner with all year round - have us come and host a pop up gift shop! (626)963-7717 ask for Caroline. Thank you for helping us change lives around the world.